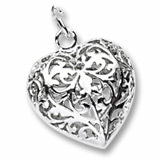 Very nice Filagree Heart Locket Charm, perfect gift for Mother’s Day? We have many charms and charm bracelets that would make a perfect Mother’s Day gift. Charms can also be used as pendants if you like.